Already a subscriber? Click here to view the latest edition on your desktop or laptop. Want to use your iPad, tablet, or smartphone? Please download the MBHH app from the iTunes or Google Play stores. Subscribers will need to use their email address and account number to log in. Questions? Visit our Digital Edition FAQ page for access details. Surviving a storm at sea during a Hurricane Island Outward Bound course in 1967 helped steer a young New Yorker away from drugs and crime and gave him a future. In which MBH&H writer Art Paine describes “the first boat he ever loved,” the Ostkust, and explains why it remains a great design. Belmont Boatworks, north of Belfast, welcomes do-it-yourselfers, as well as customers who just want someone else to do the work. An image of seagulls and their interactions gets the author thinking about his own life and the lessons he learned from a mentor. Although no longer in production, the Presto 30 is a fun and efficient pocket cruiser. The owners wanted a shingle-style house with a nautical flair, and this Deer Isle oceanfront home delivers all that and more. The qualities that made them good for rum-running during Prohibition also made builder Will Frost’s boats good for lobstering. His semi-displacement hulls, renowned for maintaining speed at capacity, have influenced the design of lobsterboats ever since. Catching rumrunners during Prohibition was one thing, but convicting them was another, as a customs agent on Mount Desert Island learned, much to his frustration. American impressionist painter Childe Hassam spent many summers painting on Appledore Island, producing some of his most wonderful work. The owner of a 32.5-foot yacht explains how he built himself the perfect boat shed. 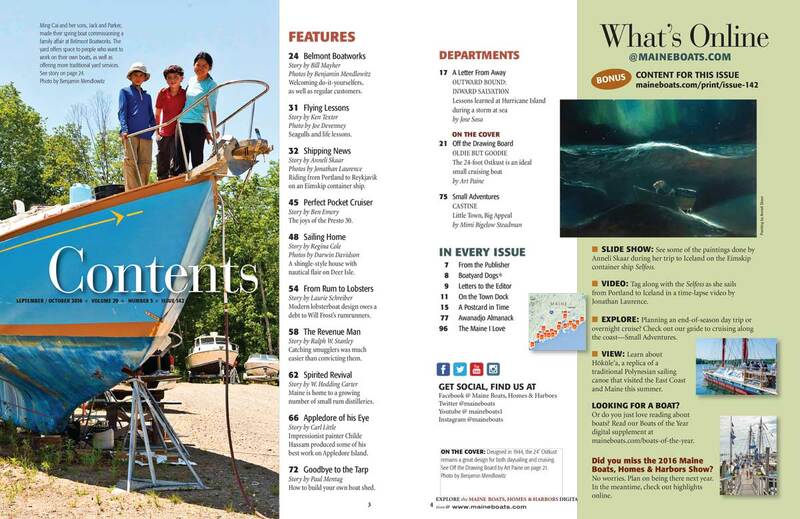 Castine: A history-filled gem of a town with coves for anchoring, nearby Holbrook Island Sanctuary State Park for exploring, and Maine Maritime Academy at the center. Rob McCall considers migration, apples and pumpkins, and autumnal shifts. Since opening its Portland, Maine, office several years ago, the Icelandic company Eimskip has been shipping more and more goods to and from Maine in its container ships. Two artists recount their ride from Portland to Reykjavik on one of those vessels. I am a painter and a photographer. There is a common thread running through both mediums. One feeds the other. I shoot primarily in film on vintage cameras. I love how it slows everything down, how it is deliberate and meditative. SLIDE SHOW: See some of the paintings done by Anneli Skaar during her trip to Iceland on the Eimskip container ship Selfoss. VIDEO: Tag along with Selfoss as she sails from Portland to Iceland in a time-lapse video by Jonathan Laurence. EXPLORE: Planning an end-of-season day trip or overnight cruise? Check out our guide to cruising along the coast - Small Adventures. VIEW: Learn about Hokulea, a replica of a traditional Polynesian sailing canoe that visited the East Coast and Maine this summer. LOOKING FOR A BOAT? Or do you just love reading about boats? Read our Boats of the Year digital supplement. On the cover: Designed in 1944, the Ostkust remains a great design for both daysailing and cruising. Photo by Bejamin Mendlowitz.